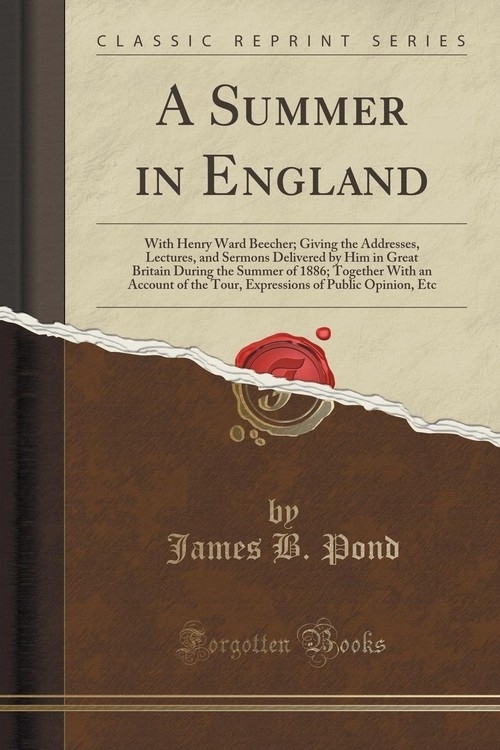 Opis: A Summer in England - Pond James B. It was my expectation to issue this volume very soon after our return from England. I had intended it to be not so much a publication as a souvenir for Mr. and Mrs. Beecher's friends and my own. But there were unexpected delays; my health was not good, and business preoccupations and disappointments laid heavy taxes upon my time. Besides these, Mr. Beecher entrusted some business of his own into my hands which demanded my close attention. I greatly desired to see him complete his "Life of Jesus, the Christ," and he was much disposed to do this, the more so as publishers had made overtures for his auto biography; one house even asking permission to send him a check for twenty thousand dollars if he would only promise to begin the work this summer. He confessed to me that no task would give him so much delight as the writing of his own remembrances; but he felt that he had neither the right nor the conscience to attempt any other literary work while the Life of Christ remained unfinished; he felt that there were moral obligations to the subscribers of the first volume and to his own work in the world which only the completion of that book could fulfil. He asked me to find, if I could, a publisher to undertake both works. Szczegóły: A Summer in England - Pond James B.
Recenzje: A Summer in England - Pond James B.